We do not imitate, we innovate. Whether it is the range of its products, its packaging or in the selection of its distribution channels, Microclair continually innovates. Thus, the company became leader in the optical accessory market by adding a dimension of design tendency to its products, all while maintaining an irreproachable quality. 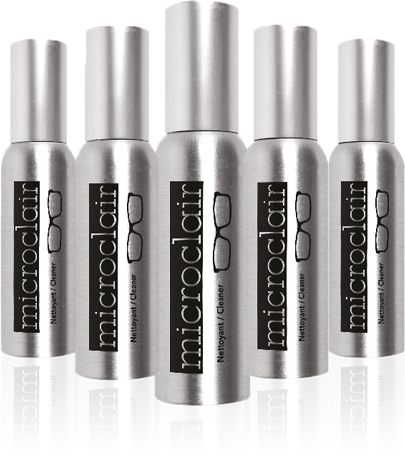 Microclair is the first company to have introduced into the optical stores throughout the world the concept of the cleaning kit to care for glasses, which contains a microfiber cloth and a high performance cleaning solution as well as a small screwdriver as an option. Microclair was the first to adapt its products to the photography industry by creating a kit that contained our patented microfiber cloth and a new specially adapted solution, without alcohol or ammonia to clean camera lenses. For the mobile phone industry, and touch screens, we have devised a practical and innovative product: the Microspot screen cleaner. It is an adhesive patch on one side so you can stick it directly on your mobile phone. On the reverse side it is a fine microfiber to safely clean your screen and remove dust, grease, oil and fingerprints. This screen cleaning patch contributed to making Microclair a leader in this industry as creators of innovative products. We also innovated by offering products specific to pharmaceutical companies, hotel chains, and the world of arts and entertainment. Because of our expertise, vision, design team and quality, we continually create and manufacture unique products. Our latest specialty products is the creation of a complete range of lens care treatments geared to the sport sector which improves the performance and longevity of sports eyewear and technical lenses.